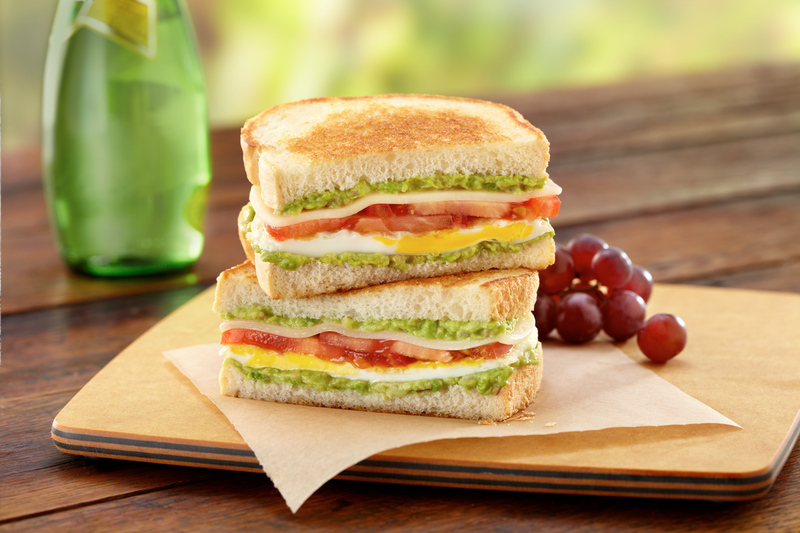 A wonderfully nutritious egg and avocado sandwich. Combine avocado, onion, salt and pepper in small bowl. Mash with fork until well mixed, then set aside. Melt 1 teaspoon butter in 10-inch skillet over medium-high heat until sizzling. Break 2 eggs into pan; breaking the yolks with a spatula. Cook until set on bottom (2 to 3 minutes). Turn eggs over and continue cooking until eggs are cooked through (2 minutes). Remove eggs from pan; cover to keep warm. Repeat with 1 teaspoon butter and remaining 2 eggs. To assemble each sandwich, spread 1 tablespoon avocado mixture onto 1 side of each bread slice. Top 1 slice of bread, spread-side up, with 1 fried egg, 2 slices tomato and 1 slice of cheese. Place 1 slice of bread, spread-side down, over cheese. Butter outside slices of bread with about 1 teaspoon of butter each. Place 2 sandwiches in same skillet and cook over medium heat, turning once, until golden brown on both sides (2 to 3 minutes). Repeat with remaining 2 sandwiches..